Since 2001, the military has discharged more than 22,000 service members from its ranks for "personality disorder," a classification once referred to as a "Section 8," according to the Department of Defense. Kathleen Gilberd, a counselor with the San Diego-based Military Counseling Project, said many service members discharged because of personality disorders, medical issues and other grounds are in fact struggling with post-traumatic stress. About one-third of service members seeking medical treatment from the Veterans Health Administration have reported symptoms of stress or mental illness, according to a June report from the VA. Of those, about half had possible post-traumatic stress, the report said. Though those figures would appear to make combat stress the largest medical condition suffered by veterans of the current wars, the ailment is not handled the same as other injuries. The piece goes on to explain that if a trooper was seriously injured, losing an arm or a leg for example, then they would be ordered to Walter Reed Army Medical Center or another U.S. military medical facility. They would have to remain there until a treatment oversight board gave the green light to return to service or make a success transition to civilian life. Even if the soldier wants to deal with his or her problems on her own, tough luck. That's not how it works with physical injuries. It's a different matter with psychological injuries, however. But because many post-traumatic stress symptoms do not appear until months after a service member's return from combat, those with the disorder don't get the same kind of "tough love." Instead, when symptoms - including "occupational instability" - appear, service members like Smith often are discharged for failing to maintain military standards, Gilberd said. "Often what we find is folks who are showing symptoms of post-traumatic stress disorder, symptoms which are treated as misconduct," Gilberd said. "So they are discharged by reason of misconduct, usually with other-than-honorable discharge." Sometimes, veterans advocates say, that leaves former service members ineligible for treatment by the VA. The article introduces the reader to Walter Smith, a veteran who served in Iraq only to come home to his dark struggles with combat PTSD. Police had to intervene once in 2004 when he held a gun to his head; he'd sought help from the VA over and over again with no relief; and he now sits in jail awaiting trial for the March 26, 2006 drowning murder of the mother of his children. Another unfortunate incident to add to the PTSD Timeline. Wayde Broberg, Smith's former roommate and a fellow member of the Utah-based company of Marines called to duty for the invasion of Iraq in the spring of 2003, ... said he and Smith hung out with a group of about eight Marines, all of whom saw heavy fighting in Iraq and all of whom suffered from post-traumatic stress. "In our little circle of pals - we hung out together, we fought together - none of us still go to the VA because it's a waste of time," Broberg said. "Wally was the only one still trying to go." Broberg said Smith "tried 100 different times" to get help from the Veterans Affairs medical system. "Probably two or four times a month, he'd go up to the VA," he said. "He didn't get what he was looking for." Susan Huff, a spokeswoman for the George E. Wallen VA Medical Center in Salt Lake City, where Smith and his fellow Marines say they sought treatment, would not respond to questions about individual cases but said the number of veterans being assessed for post-traumatic stress has increased 75 percent over the past year. With the crush of returning troops coming in for care, the ability to help every one of them is reduced. The VA Office of Inspector General concluded in a recent report that post-traumatic stress disorder treatment at the VA "is woefully inadequate." Paul Rieckhoff, director of the Iraq and Afghanistan Veterans of America, put it another way: He called the lack of support the Utah Marines appear to have received for their illnesses "par for the course." "There needs to be a proactive system, not one that waits for problems to develop," he said. "We can pay for the transitional care, pay for screenings and pay for a proactive approach now, or we can pay for jail cells, lawyers and trials later on." A very sad state of veterans affairs. 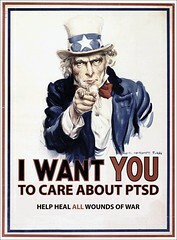 Personality Disorder -- Or Combat PTSD?